Happy day of love, babes!! 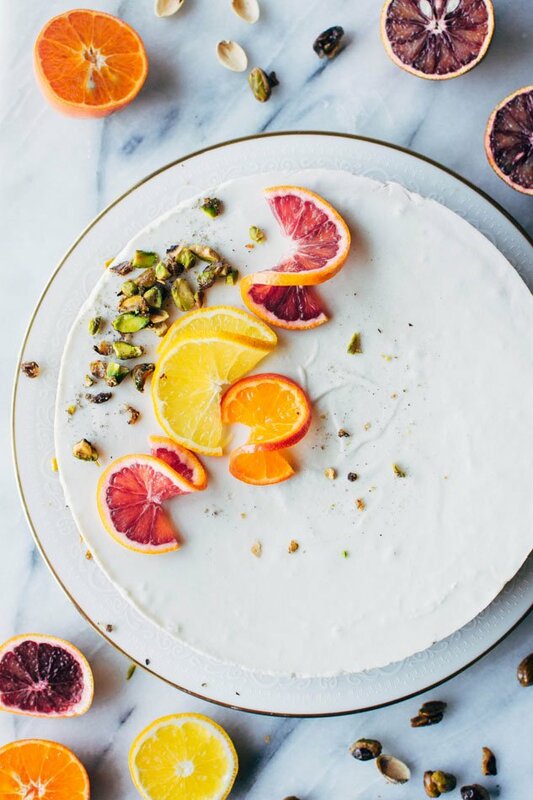 Let’s celebrate with some blood orange and cardamom pistachio no bake greek yogurt cheesecake! 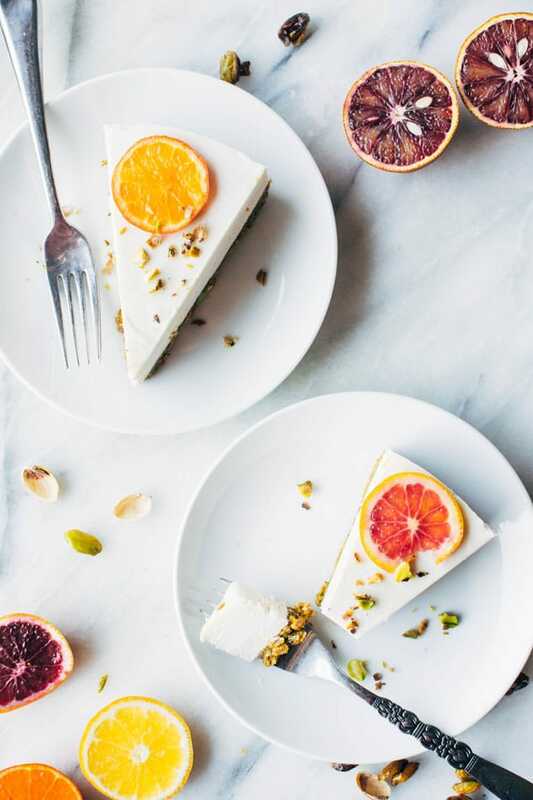 We’re not super into celebrating Valentine’s day around here, but we do always exchange cards and make sure we carve out some time to do something special together, and that usually involves some delicious food. I had been playing around with some ideas for what I wanted to make this year, and my original idea for these flavor components were some naturally sweetened mini pavlovas with coconut whipped cream (before I gave up sugar, pavlova was my alllll time fave dessert! —-> This recipe <—- you guys. If you’ve ever been to a party at my house I know you’ve had it), but they turned out pretty sub par (recipe fails = real life!). So with a bowl full of every kind of cute citrus I could find at the grocery store sitting on my counter and some cardamom candied pistachios just chilling in a jar I went back to the drawing board. And this cheesecake turned out to be everything I could ever want in a Valentine’s day (or eeehmm any day for that matter) dessert. 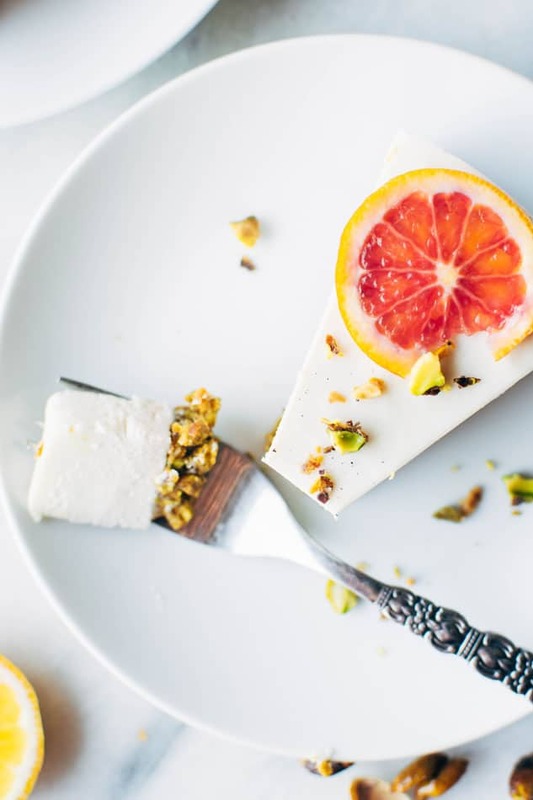 Totally indulgent, creamy, bright and full of contrasting textures and packed full of nutrients and healthy fats like no cheesecake you’ve ever had before. As the name suggests – It’s of the no bake variety, made with greek yogurt, coconut, and gelatin – to make it set up nice and firm. The crust is made with pistachios, sweetened with dates, some cardamom (my new fave spice, obvi! ), sea salt and ghee, which could easily be swapped out for coconut oil. I’ve gone the extra mile with the whole cardamom pistachio thing and candied some whole pistachios as well. It’s a super easy // fast technique (same one I use in this post for candied pecans!) that once you learn, you’ll probably come back to again and again. But if you’re short on time you could skip the candying step and just garnish with roasted cashew pieces. There’s a bit of blood orange juice mixed into the base that adds a nice bright citrusy flavor to the cheesecake. Like a little bit of sunshine on a February day! 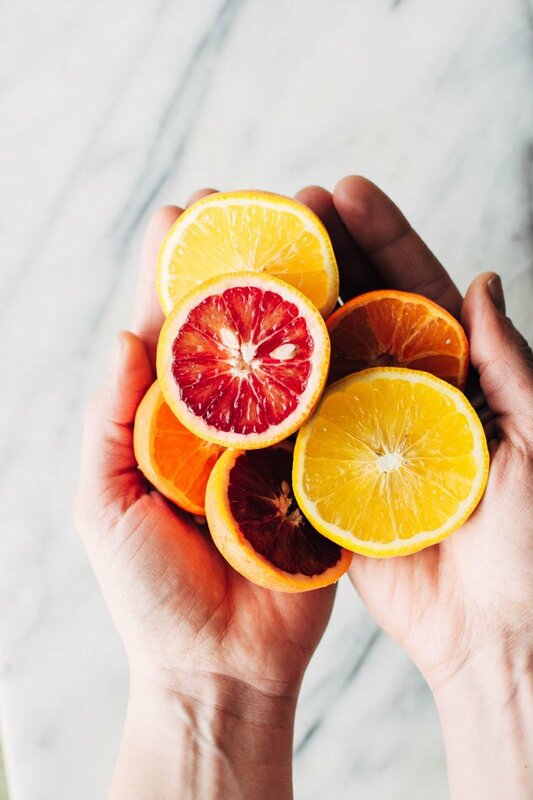 citrus = winter’s perfect fruit. This lovely treat is based off of a recipe from my friend over at Bare Root Girl. If you’ve never been to her website I highly encourage you to check it out! 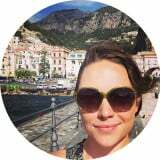 When I first started down the path of a paleo-ish lifestyle she was one of the food bloggers that gave me hope for a continued pursuit of delicious (not boring) food. 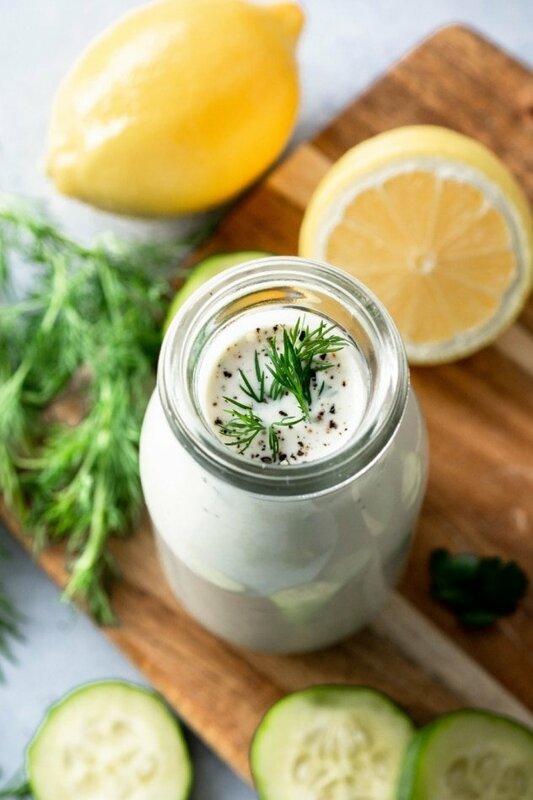 She has a ton of amazing recipes and info on eating Paleo in a healthy, sustainable way. Her recipe for no-bake greek yogurt and berry cheesecake was one of the first recipes I made from her site, and one that has followed me around through many seasons. For the coconut portion of this recipe I use creamed coconut – it’s a whole coconut product with more pulp and definitely a lot thicker than coconut milk // coconut cream. Since the creamed coconut is on the harder side, I usually chop it up before adding to the food processor // blender, but you could also soak the little plastic bag it comes in in some hot water and knead it gently every so often until it softens up a bit. If you can’t find this product at the store you can buy it here for a reasonable price. Otherwise, coconut cream would also work (this is what’s used in the original recipe), it will just result in a slightly softer cheesecake. 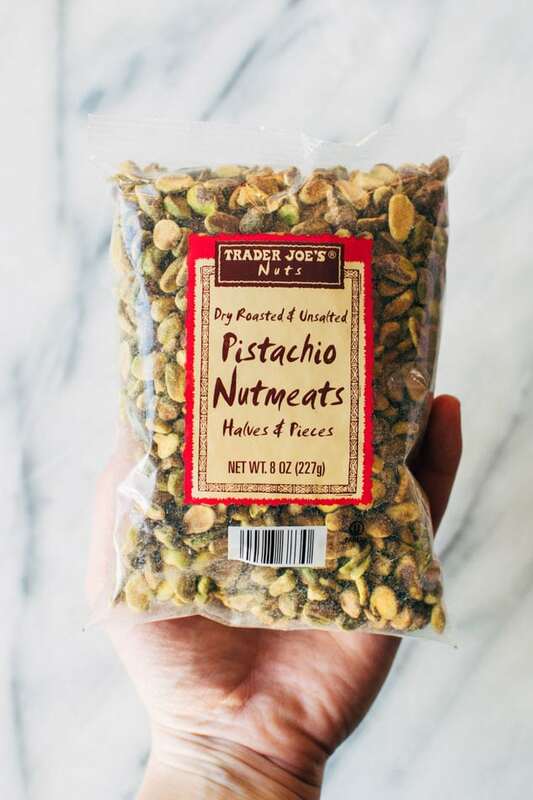 Trader Joe’s has a great price on roasted unsalted pistachios, which are what I used, but you could also mix some pistachios + some almonds (as long as you toast them first or you buy them already toasted) since pistachios can be kind of pricey. 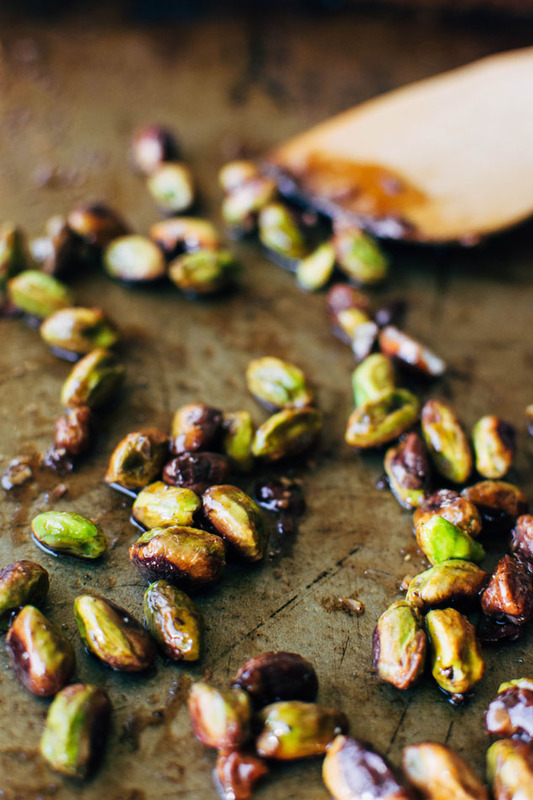 For the candied pistachios that garnish the cheesecake I used whole roasted + unsalted pistachios for the pretty purple color of their skins. And that’s a wrap for today, loves! Sorry for alllll of the pictures. I couldn’t pick just a few for this post! 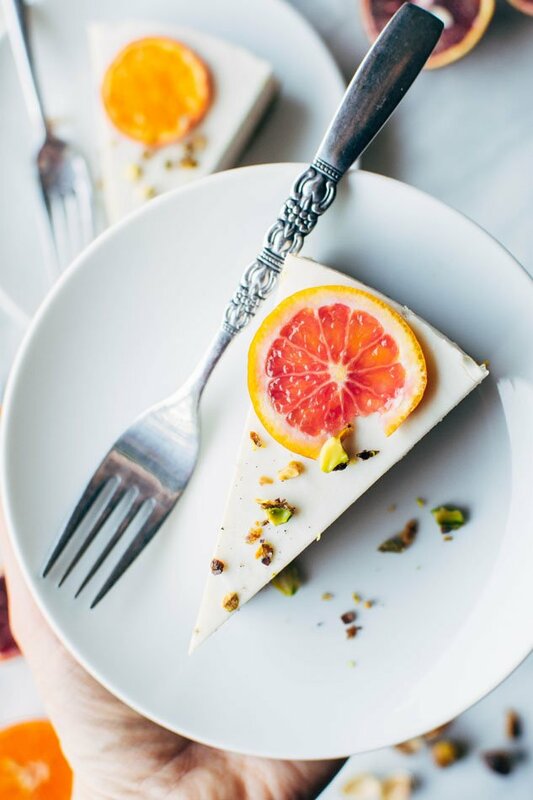 Citrus + cheesecake + crushed up candied pistachios are just all so magically photogenic! I started with 77 final cut pictures (whaaaat – now I know where all of my time is going) so the fact that I narrowed it down to this many is actually pretty impressive. It’s all about perspective, right?! I hope you all have a beautiful day filled with sweet treats like this. Thanks for making it to the end of this super, long super LOVE filled post! You guys are the BEST!!! 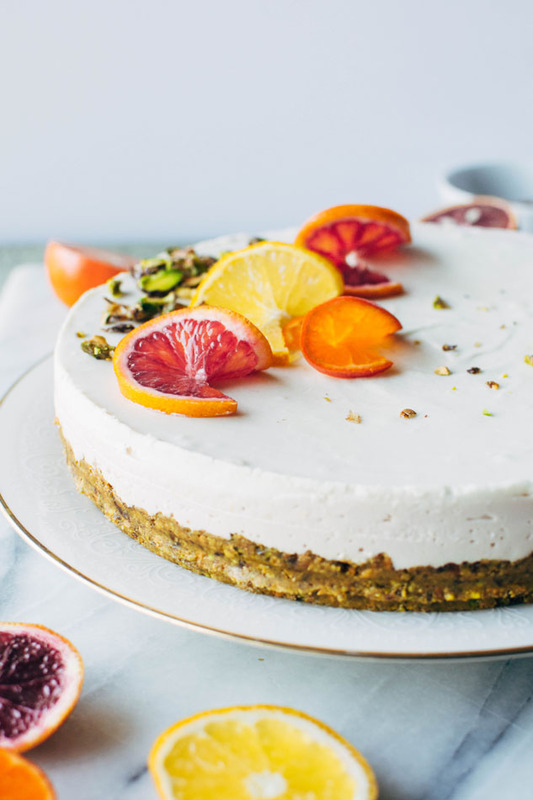 Blood orange and cardamom pistachio no bake greek yogurt cheesecake! 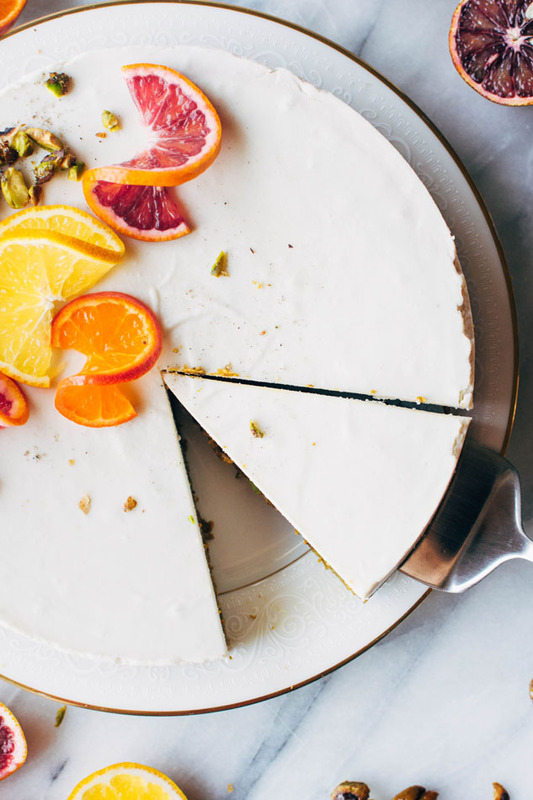 A delightful + healthy gluten free dessert that will satisfy your cheesecake loving sweet tooth. 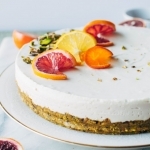 Made with greek yogurt, coconut, blood oranges, vanilla, a date-sweetened pistachio crust and topped with fresh citrus and cardamom candied pistachios. Mix all ingredients together in a small bowl and spread in an even layer on a parchment lined baking sheet. Bake at 375 for 6 minutes, take out and stir, and return to the oven for another 2 minutes. Remove from oven and set aside to cool. 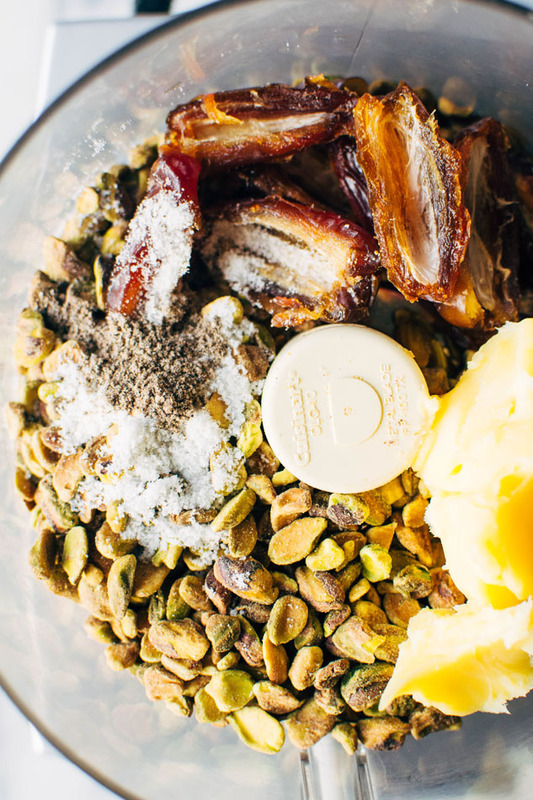 Process all ingredients in a food processor until well combined, stopping every so often to scrape down the sides, and to poke around and make sure that all of the dates have been incorporated. 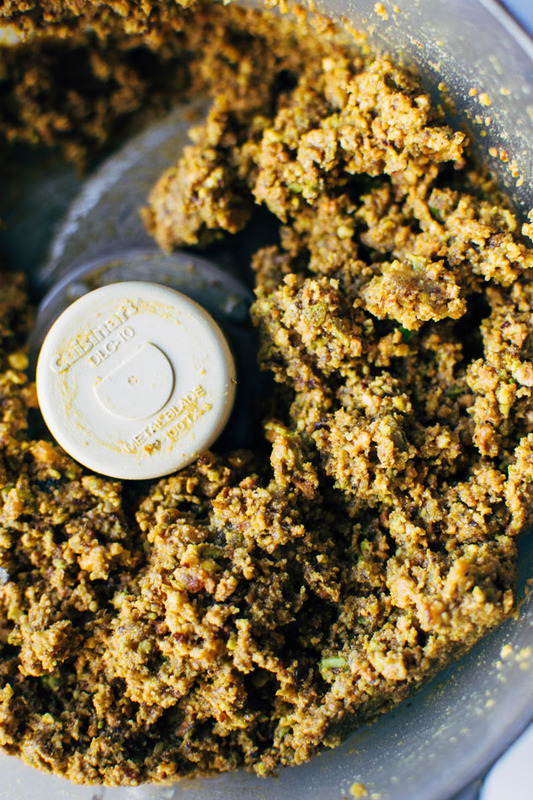 I have tried doing this step in my vitamix, and while possible, it doesn’t turn out quite as even – some bits end up too processed while other pieces remain practically whole. Press into a 9 inch springform pan using a spatula or hands, and pop into the freezer/fridge for about 30 minutes to set. Heat lemon juice and blood orange juice gently until just about to simmer. Quickly whisk in gelatin until incorporated and set aside. 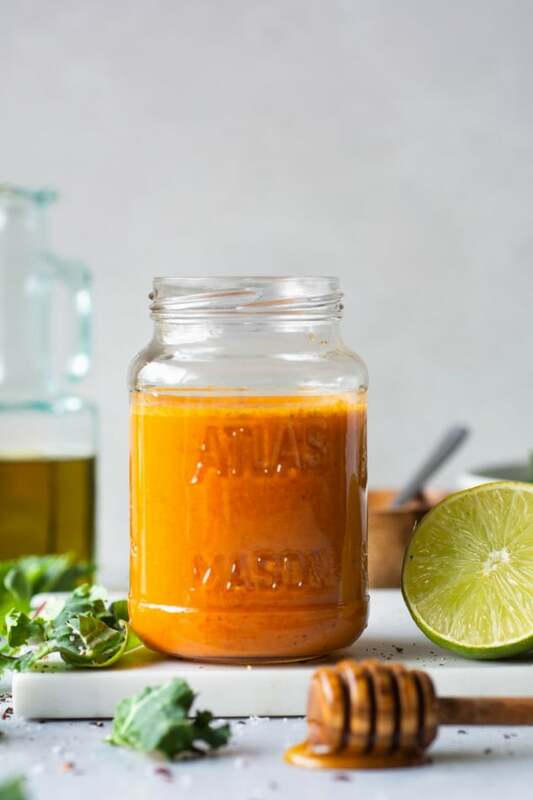 Add all other ingredients (except citrus slices for garnish) to a food processor or blender and mix on high until very smooth. 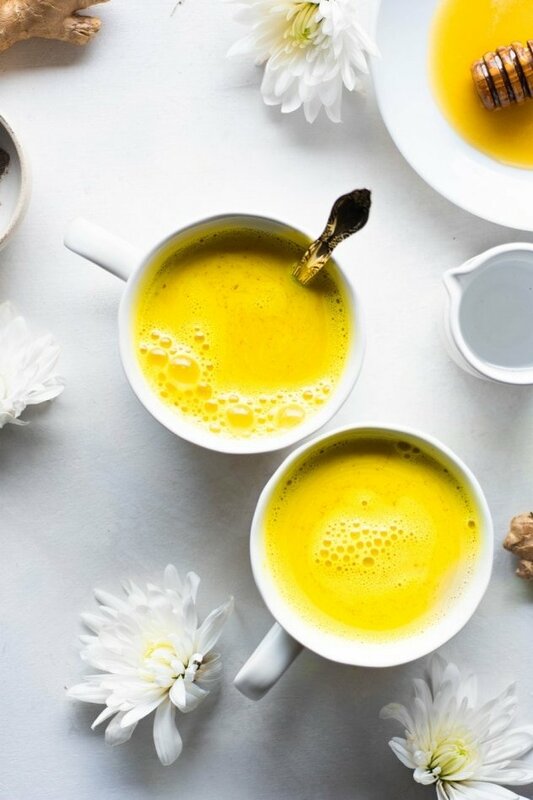 With the motor running pour in warm citrus juice + gelatin and blend for at least 30 seconds, until the gelatin and citrus mixture is very well incorporated. 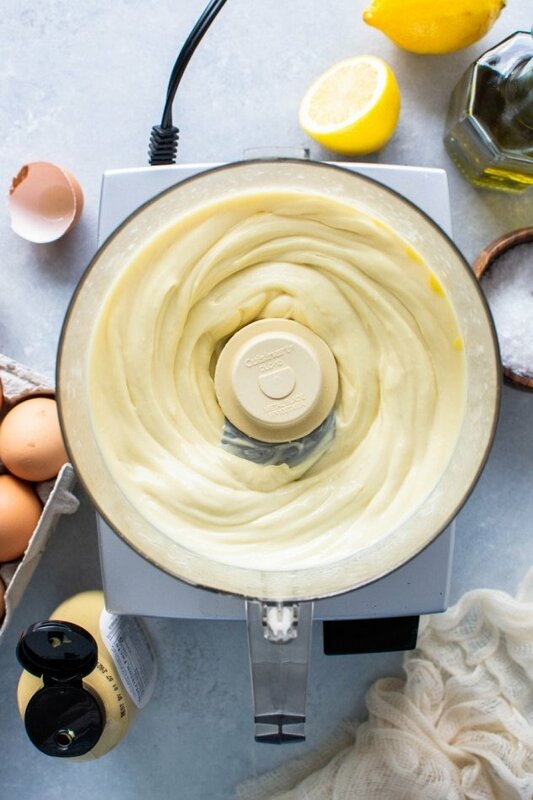 Pour cheesecake mixture into crust and smooth with a spatula. Tap a few times on the counter to pop any bubbles that may have formed inside the cheesecake. Allow to set up in the refrigerator for at least 2 hours, or ideally, overnight. The setting up process can be sped up by putting the cheesecake in the freezer for the first hour. While it can be eaten straight out of the refrigerator the best consistency is reached if you take it out about 20 minutes before serving. 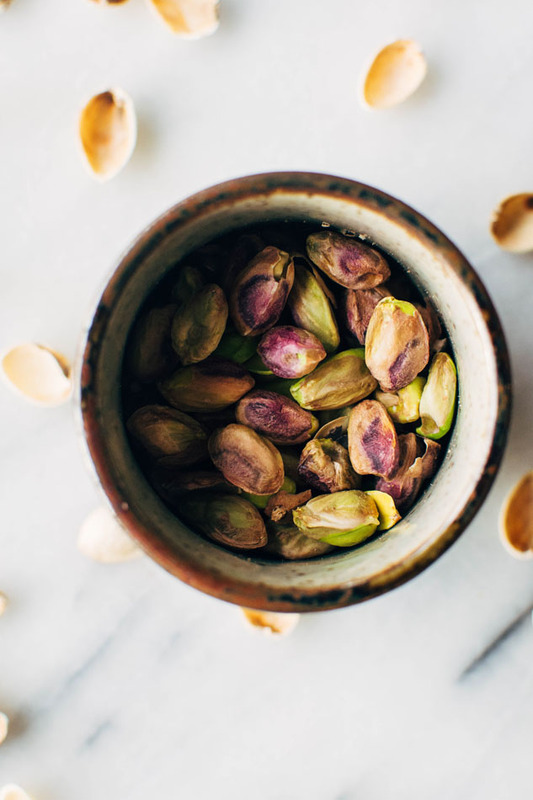 Garnish with citrus slices and crushed candied cardamom pistachios and serve! I have had some feedback from those who have made this cheesecake with coconut cream that it resultsin a not-so-firm final product. 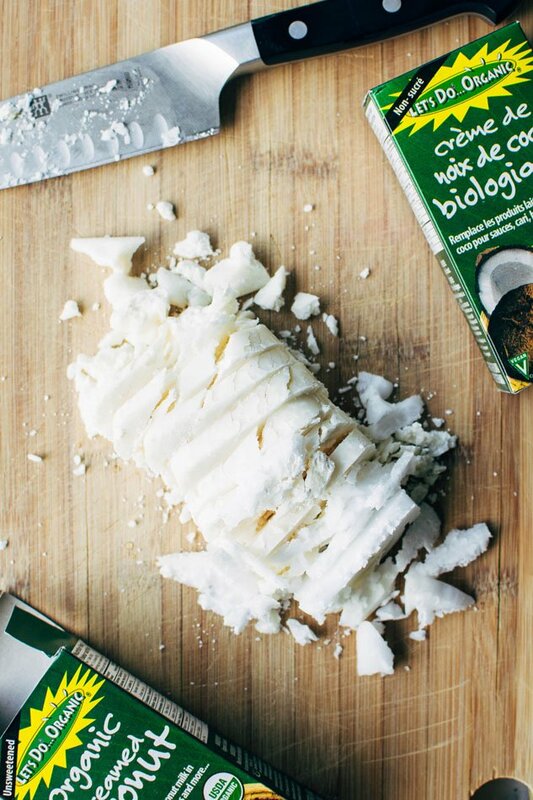 So with that in mind you may want to either increase the amount of gelatin to 3 1/2 tbsp if you plan to use coconut cream instead or stick to creamed coconut! This entry was posted in sweets and tagged coconut, easy, gelatin, gluten free, grain free, healthy, quick on February 14, 2017 by Nyssa Tanner. Great job Nyssa! I love all the pics! I can’t wait to make this next week. Thanks for taking the time to share this with us. I am going to make this!!! When I work up the nerve!! But first, what can I substitute for gelatin to keep this vegetarian? I made this earlier in the week and it turned out great! Mine is a light pink color from the blood orange juice- very pretty. It’s delicious- perfectly tart and sweet. I made a shortbread crust (because more butter?) but it would be good on it’s own, even with no crust at all! Alex! yay!! So glad you made this decadent beauty and that you loved it!! It has a special place in my heart 🙂 And shortbread crust? So much yes.